FACTS Market size will surpass USD 2.5 billion by 2025, as reported in the latest study by Global Market Insights, Inc.
Power transmission industry over the years, has witnessed substantial growth on account of growing demand for effective T&D control systems. Rising demand for revamping of traditional electrical network in line with soaring fund flow towards efficient grid enhancement will drive the FACTS market. Safe operation, network reliability and economical costs are some of the key factors projected to stimulate the industry landscape. Improved system stability, lesser installation time and increase in transmission capacity are few essential parameters augmenting the installation of series FACTS market. Moreover, favorable consumer inclination toward the installation of these products to safeguard the system peripherals coupled with enhanced operational life of the electric network will further boost the industry dynamics. Ability to curb unbalanced loads, voltage fluctuations, resonance across varying active or reactive loads along with power oscillations have incorporated a positive scenario for SVC units. Increasing integration of energy efficient, reliable, secure and advanced fire-resistant electric equipment have further upscaled the FACTS market share. Increase of thermal loading, power flow control, decrease in short circuit level, loop flows control, post-contingency voltage control are the few indispensable parameters favoring the growth of FACTS units across steady state deployments. Moreover, improved voltage stability, greater reliability, reduced losses in power systems and fast acting switching response will nurture the overall FACTS market. Ongoing enhancement of transmission infrastructure across commercial & residential installations have strengthened the 132kV to 220kV FACTS market. Versatile product configurations along with aesthetic proximities are the key factors enhancing the product penetration. In addition, institution of sustainable energy infrastructure has obligated utilities and installers to focus on revamping the existing electrical network. Process and manufacturing industries in the recent years, are crucial across emerging regions for investments and revenue realization. Developed countries have also observed substantial dependency on processed & manufactured units which in turn have shifted installer & utility inclination toward the adoption of effective grid infrastructure across their platforms. Increasing global mining activities & metal extraction have further led to an upsurge in demand for power networks to ensure continual operations & process reliability which in turn will amplify the FACTS market share. 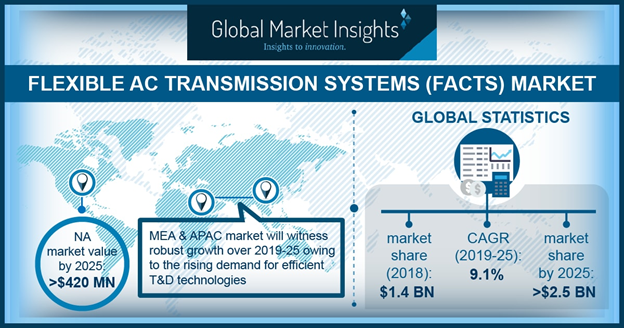 FACTS market across Africa, Asia Pacific and Middle East has observed a substantial growth in conjunction to the increasing demand for efficient transmission & distribution technologies. Growing demand for retrofitting of prevailing electrical coupled with rising fund allocation across the electricity sector will enhance the industry outlook. Regulators across Saudi Arabia, in 2018 have proposed to capitalize amount worth USD 130 billion in their Water & Energy projects. Prominent FACTS market players include BHEL, GE, ABB, Siemens, Mitsubishi Electric, NR Electric, Rongxin, Infineon, Hyosung, American Superconductor and Ingeteam.